Many of the apps on your Mac have a toolbar; that’s the gray section at the top of the window that contains a number of buttons and, perhaps, a search field. You see this in Safari, Mail, the iWork apps (Pages, Numbers, Keynote), and even in the Finder. The buttons available in these toolbars let you quickly access some of the most common functions of their apps. 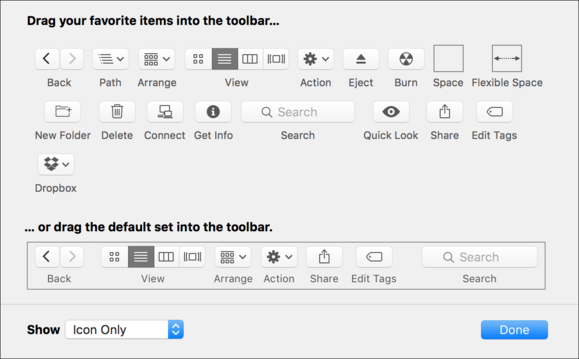 Tweaking the Finder toolbar can help you become more productive. You can add buttons for functions you use often, ones that might be harder to access via menus. You can add a specific button that offers most of the same menu items as the Finder’s contextual menu; this is great if you’d rather click a button than right-click or Control-click. And you can use the back and forward buttons to move through windows or tabs you’ve viewed, and use the Finder view buttons to change Finder views. To start with, you should check out which buttons are available in the Finder toolbar. By default, you see the Back and Forward buttons, the four View buttons, the Arrange button, the Action button, the Share button, the Edit Tags button, and a Search field. This is the default button set for the Finder toolbar. If you simply want to thin out the toolbar, you can remove any of these buttons easily. Just press and hold the Command key, and then drag one of the buttons off the toolbar. And if you want to rearrange the buttons—you might prefer the Search field to be on the left, for example - press and hold the Command key and drag a button to where you want it. But you can do a lot more than just move and remove buttons. You can add a number of other buttons and fields to the Finder toolbar. To see these, choose View > Customize Toolbar. You’ll find a number of buttons for actions that you may use frequently. To add any of these items to the toolbar, just drag and then release them where you want them to live. You can move them around, and you can add spaces; you’ll see there are two types of space, a regular, fixed-width space, and a flexible space, that changes its size according to the amount of room there is. Click and drag the buttons you want from this window to the toolbar. Action: The Action button is part of the default button set. It’s the equivalent of the contextual menu, which you display by right-clicking or control clicking an item. The Action button’s menu changes according to what is selected, offering a range of actions you can perform on an item. View: This button lets you change Finder views. (Learn about Finder views in this article.) However, you may never or rarely want to change your windows’ views. If so, you can remove this button, saving a lot of space. Just drag it off the toolbar and you can still change views from the Finder’s View menu or by using keyboard shortcuts. Share: The Share button lets you quickly share items in the Finder, sending them via Mail or Messages, or sharing them on Twitter or Facebook, or to other apps or services. You can access this feature from the contextual menu (right-click an item and choose Share, then choose a service from the sub-menu), but if you share a lot, it’s good to have this button handy. Edit Tags: If you use Finder tags, you’ll find that this button streamlines adding and changing tags. After you’ve made your choices, click Done. Note that, from the Show menu at the bottom left of the Customize sheet, you can choose to display Finder toolbar buttons as Icon Only, Text Only, or Icon and Text. I find Icon Only to be the most economical; it’s better than just seeing the names of the buttons, and once I’ve remembered what each button does, it saves space by not displaying their names below the icons. Try the different options and choose what works best for you. In addition to the stock toolbar buttons, you can add any file, folder, or app to the Finder toolbar. This gives you quick access to items you use often. To add an item to the toolbar, hold down the Command key and drag it to the toolbar. You can drag it to the exact position where you want to use it. When you release the Command key, the icon will stay where you want. 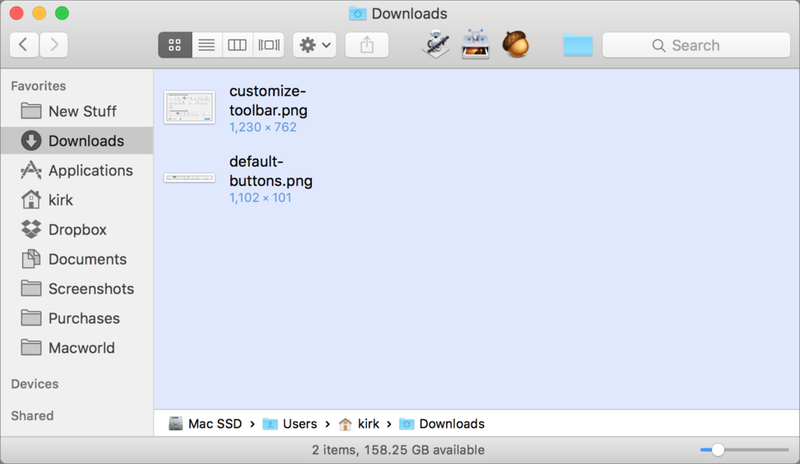 You can add files, folders, and apps to the Finder toolbar. Here’s my Finder window, with two apps and an Automator workflow I use often, and a folder I want to access quickly, but don’t need in the sidebar. This is very useful if there’s an app you want to access quickly: it can be quicker to drag a file to an app’s icon in the toolbar than, say, dragging a file to the Dock, which is further away. Or you may have a network volume you connect to regularly; just drag its icon to the toolbar, and you’ll be able to access it in one click from any window. 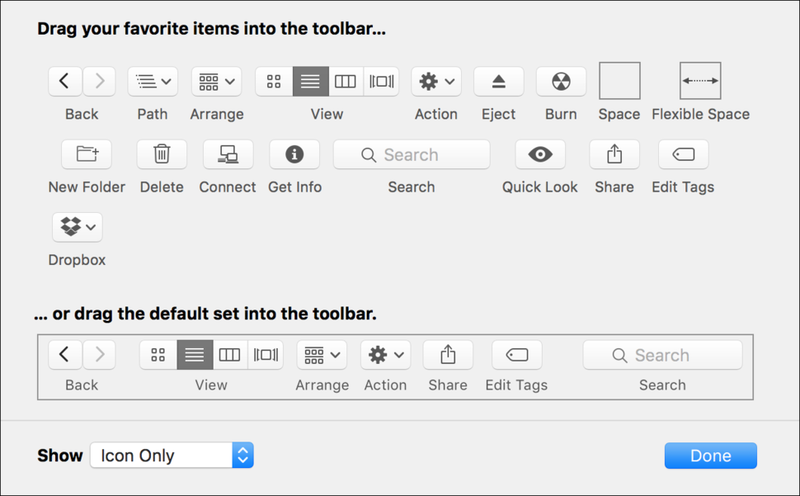 Take advantage of the Finder’s flexible toolbar. It can save you time and make you more productive, giving you quick access to the functions you use most.